Grilled Chicken Breasts, spicy Teriyaki marinade, Thyme for Cooking. 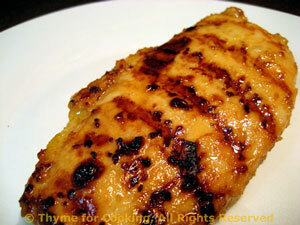 Using a hot mustard with the Teriyaki sauce gives these chicken breasts an intense flavor. Poke the breasts with a fork to let the marinade seep deeper into the chicken. Pour over the chicken and let marinate for 10 - 15 minutes. When ready, cook on barbecue grill for 10 - 12 minutes, turning once or under broiler for same amount of time or sauté in nonstick skillet for 12 - 15 minutes; in all cases cook until done. Remove chicken, slice nicely (if you want... or not) and serve.